EPA (or an EPA authorized state), and to be trained in the use of lead safe work practices. We are a lead safe certified firm because we understand the importance of good health both your family and ours. Below we have some links containing information about lead and the law. In an effort to deliver exceptional service to our clients, we have implemented the use of BuildClean Dust Control Systems as pictured left. 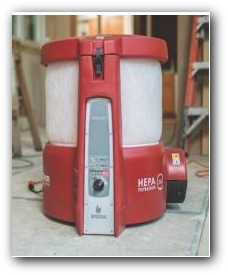 It eliminates up to 90% of airborne dust which helps us meet the EPA and OSHA requirements for lead safe practices. Most importantly, it makes each one of our projects a cleaner and healthier environment.